The Baynhams: Canberra from the teachers perspective. I talked on an earlier post here about Sian being home from Canberra and what a star her teacher Graham Jennings was. He wanted to post one of his photos from the trip here so he emailed it to me. I got his permission to upload it with the text of his email. 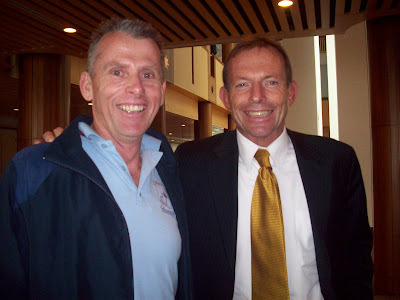 The politician in the photo with Graham is Tony Abbott who was in the news today because he was elected leader of the opposition by one vote! A very topical photo and a coincidence to be blogging it on the same day he is elected. "Canberra was a fantastic time! 1 000 000 000 000 000 photos Sian took!!!! In regards to the attachment, it’s amazing who you come across when you walk through parliament.